The New York Giants went a pitiful 5-11 in the 2018 NFL season. They started the season 1-7 but had a decent second half of the year. This was because of the offensive improvement. The Giants’ offense showed signs off life in the second half of the 2018 season, scoring 20+ points in seven of their final eight games, including three games with 30+ points and one game with 40 points. It finally looked like the Giants had a good thing going and were going to build on this offensive success this offseason. That was until the Giants traded away their best offensive player. Superstar wide receiver Odell Beckham Jr. was traded to the Cleveland Browns, causing many fans to lose hope in the Giants and predict that the offense will be abysmal in 2019. However, there are reasons to believe that this is not true. The Giants’ offense will not be worse in 2019. In fact, the Giants’ offense will improve in 2019. Saquon Barkley had an absolutely spectacular rookie season in 2018. The rookie running back ran for 1,307 yards and 11 touchdowns en route to winning AP Offensive Rookie of the Year. On top of that, Barkley was a force as a receiver, too. Saquon caught 91 passes for 721 yards and 4 touchdowns. That is a total of 2,028 yards from scrimmage. He is only the third rookie running back in history to accomplish this feat. Saquon accomplished all of this despite being held back in the first half of the season. In the first half of the season, Saquon averaged 13.85 rushing attempts per game. The Giants increased his workload in the second half of the season with 18.75 rushing attempts per game. 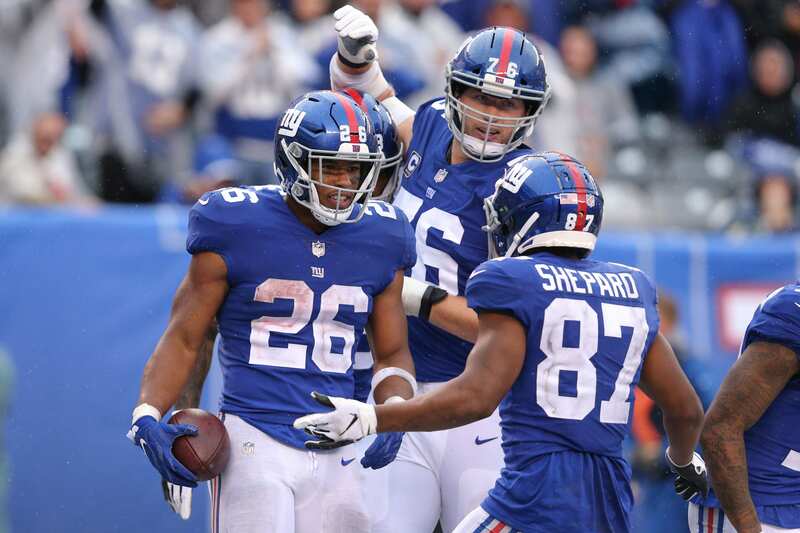 It is no coincidence that once Saquon’s touches increased, the Giants’ offense improved. In 2019, the Giants will not wait until the second half of the season to unleash Saquon Barkley. He is the real deal. Saquon is arguably the best running back in the NFL and the Giants are well aware of that. Trading away Odell Beckham Jr. proved that the Giants plan on running the offense through Saquon from now on. The offense will improve by leaning on a run-first attack lead by Saquon Barkley. Evan Engram is one of the most versatile tight ends in the NFL. His rare combination of size and speed allow him to be a matchup nightmare. Engram was impressive in his rookie season and flashed his potential in his sophomore season, too. However, Engram needs to remain healthy and improve his consistency in order to take his game to the next level. With Odell Beckham Jr. no longer on the field, stats seem to indicate Evan Engram will be a much-improved player. In the past two seasons, Odell missed 16 games. In those 16 games, Evan Engram was a whole nother player. When Odell was on the field in 2018, Evan averaged only 36.7 receiving yards per game. Without Beckham on the field, Engram averaged 80 receiving yards per game. Expect to see Evan Engram flourish with an expanded role in 2019. Could the New York Giants Trade Picks With the New York Jets? New York Giants: What if Kyler Murray Drops to the 6th Pick?